That’s why one of the most critical things marketers can do is take the time to plan out their own social media content calendar. Social content calendars allow you to plan and schedule out months of quality social posts ahead of time, and save a ton of time sharing it on social. This post details how you can create a unique social media editorial calendar, and some of the tools that make it easy to find and share social content. Lastly, a social media editorial calendar is important because you can schedule content at the optimal time. Pull all of your unique social media analytics with a tool like Sprout Social, Twitter or Facebook Insights. It’s a good way to keep track of your content ideas and even has an additional calendar add-on you can use to get a monthly view of your planned content. That’s why one of the most critical things marketers can do is take the time to plan out their own social media content calendar. Social content calendars allow you to plan and schedule out months of quality social posts ahead of time, and save a ton of time sharing it on social. This post details how you can create a unique social media editorial calendar, and some of the tools that make it easy to find and share social content. Sometimes brands can churn out social posts very quickly. For instance, Totino’s immediately jumped on Twitter with a witty Tweet in response to Saturday Night Live’s pizza roll skit for the Super Bowl. But more often than not, it takes companies more than a few minutes to find or create something to share. Campaigns like #MBPhotoPass from Mercedes-Benz don’t come together in a matter of minutes. It can take months of planning and tweaking to keep the campaign fresh and effective. Plus, real-time marketing relies heavily on happenstance and coincidence. There’s no way Oreo could’ve planned on a blackout during the 2013 Super Bowl. But the reward was massive. Planning social media posts in advance ensures you always have quality content to share with your audience on a consistent basis. 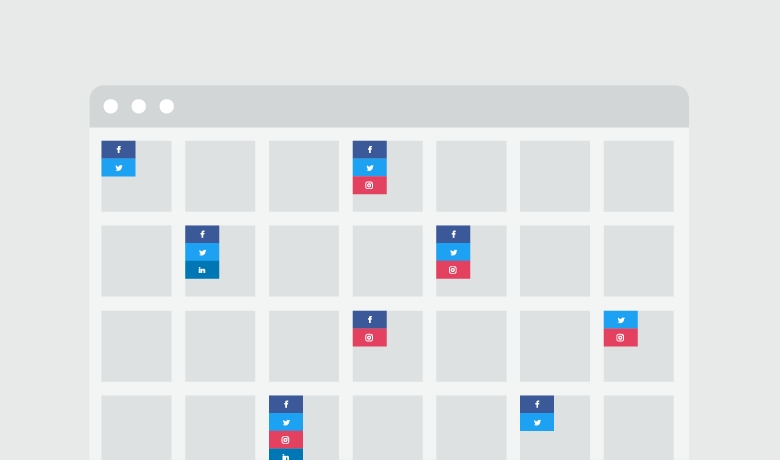 A social media calendar builds the framework for what you’re going to share, then you can fill in the gaps by manually sharing posts, responding to incoming messages and engaging with your audience. Lastly, a social media editorial calendar is important because you can schedule content at the optimal time. With more networks switching to algorithm based feeds, you need to do anything you can to get more exposure for your posts. One simple tactic you can use is to post when your audience is most active. 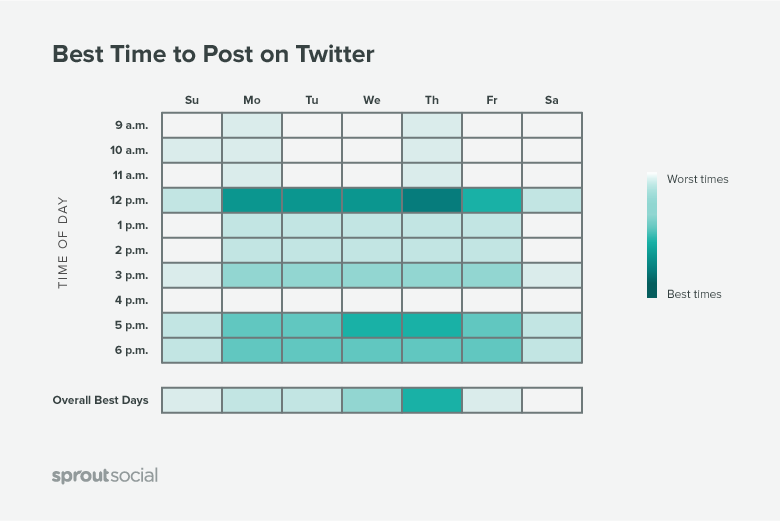 We wrote an entire post on the best times to post on social media that will give you great insights. For instance, we found posting weekday afternoons is optimal for Twitter. In addition to our research, you should also look into your own analytics, which we’ll dive into later. There’s nothing worse than realizing you don’t have anything to share at the last minute. Plan ahead so you don’t get caught off guard. Before you start searching for content to share on social, you need to figure out what your audience actually likes. A fantastic way to do that is to look at past social media posts to see which were most successful. We’ve written an in-depth article on how to find your successful posts by conducting a social media audit, but the easiest way is to access your analytics. Pull all of your unique social media analytics with a tool like Sprout Social, Twitter or Facebook Insights. 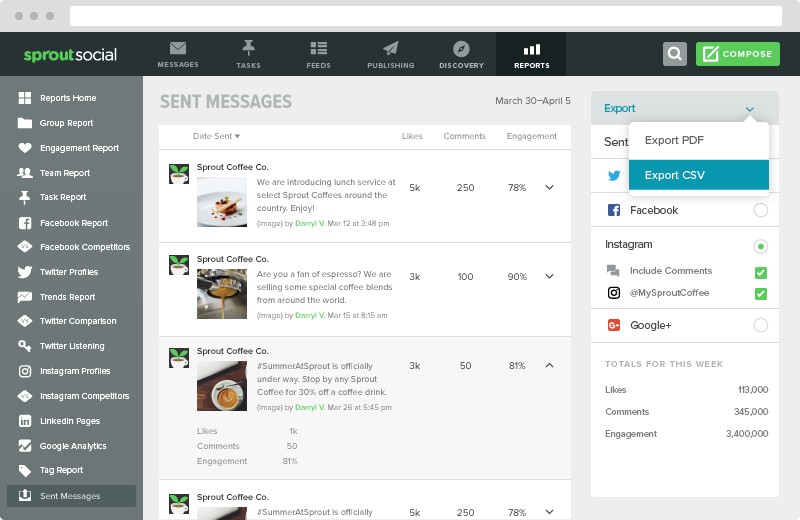 Below is an example of how to view your Sent Messages with Sprout (available with a free trial). Make sure you’re sorting your messages by the metric that is most important to you, whether that’s clicks, responses or total reach. Once you have an idea of what kind of content works best, you can move onto the next step. This step depends on a handful of different things like the company, your audience, the campaign, and the social networks being used. Always keep your audience in mind and ensure you’re not bombarding them with posts that are irrelevant or inappropriate.